Of course with any boat, there is ongoing maintenance. With a moored boat (as compared to a trailered boat), the maintenance is of course many times more, even if you do not use it. The following is some of the maintenance we have done since returning from Queensland in late 2015. When we took Catlypso out over the Easter Long Weekend in 2016, we found that the house batteries were in a bad way. We have thought that they were on their last legs as on the 2015 trip, we did not always get the full output that we expected (when we had many days of cloud). We had four 100 amp hour (ah) batteries and what appear to be two 255 ah giving a total of 910 ah (only worked this totally out when Michael removed the smaller batteries, we thought they were 120 ah or so). 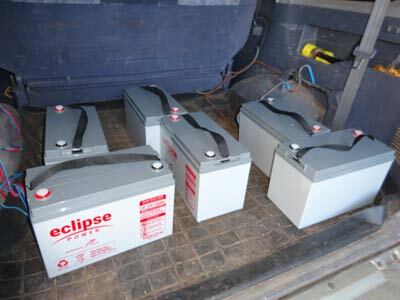 In late April 2015 we purchased on-line (from Brisbane) six Eclipse 125 amp hour deep cycle AGM batteries. These are made by Ritar and the total cost including delivery was $1,480. We figured this would give us a total of 750 ah, a fair bit less than before, but hopefully as these are new, we would have enough. If not, there is space to fit a couple more! The six new batteries in the back of the Prado on the way out to Catlypso. Four of the new batteries in the battery compartment on Catlypso. In late May Michael took the batteries out to Catlypso. This was a major job in itself. He had to use our dinghy, Thunderbird 2 to transport them three at a time (and bring the four smallest ones back, the other two will require assistance as they are so heavy). He lifted the equivalent of 80 30 kg batteries in the process (lifting in and out of car, in and out of dingy etc). His back was killing him by the end of the work. Anyway, when he went out, the batteries were totally dead, as three of the four 100 ah batteries had totally died. He connected up four straight away and left the 255 ah batteries as they appear to be okay and are in a separate bank (they are not - see next paragraph). Over the last weekend of May 2016 we went out to the boat for four days. Due to the fact that the old batteries (the 255 ah ones) were totally flat when Michael connected the new batteries up, the batteries overall were very low in voltage. During this weekend we ran our portable generator for 9.5 hours and finally got the voltage up to a reasonable level (about 12.5 volts). Michael also worked out that the two banks are not as clearly defined as previously thought. It turns out that two of the new 125 ah batteries are in Bank 1 and two 125 and the two 255 ah batteries are in Bank 2. 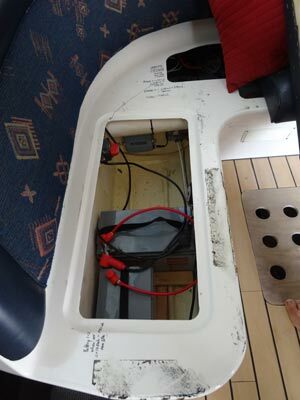 Michael also added one of the unused 125 ah batteries into a separate compartment (connected by an ON/OFF switch that had never been used by us). 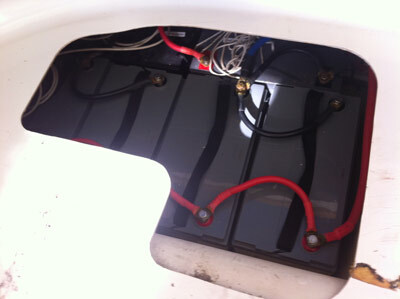 A bit over a week later he went out again and put the other battery in this compartment as well as linking them up. This gives us Bank 1 of 500 ah and Bank 2 of 760 ah, meaning a total of 1,260 ah. In addition, the voltage of both banks was 13.3 volts, the highest we have ever seen. The windows have always leaked. When we bought the boat we knew that there was water getting in through the seals. We stopped the leaking for the most part till late 2015 when we kept getting water in no matter what we did. Additionally, the windows are starting to separate from the deck. We plan to take Catlypso to The Boat Works on the Gold Coast in mid-September 2016 to have them repaired. We have had some small leaks on the port side for the past four months but have had problems finding where it is actually coming in. Over the last weekend of May 2016 we probably found the spot and put some silicon over it. It looks like this one spot right up high on the highest window might have been dripping through to about three or four spots well below. However, we still get some water in when it rains very heavily. As readers of this site will be aware, when we had the mooring installed, it was stuffed up big time, put in the wrong place and it took us forever to get the contractor to move it to the the correct spot. We were also not happy with his workmanship. In mid-May 2016 I contacted a mooring contrator to have the mooring serviced. However, once again we were let down and he did not call back to advise when he would do it. Michael then contacted four other mooring contractors. One did not answer nor did he ever. Another said he did not do Port Hacking despite his ad in a magazine saying he did. Another did reply after a couple of calls (did not return the first call) but then never contacted again after asking to send him an SMS (which we sent three times). Finally we found someone but with a six week delay. I had hoped we would get it done soon but as of late August it still has not been done. I will be cancelling the order as we are leaving in two weeks and will not be using the mooring till late 2017 at the earliest. This is not working, no idea why. I will remove it when we get to Queensland and bring it back to Sydney to be looked at by my friend. This was working perfectly but on the way back from Queensland in 2015 it stopped working properly. The output dropped from about 22 - 25 litres per hour to about 10. Despite trying a lot of things, we could not get it working again properly. We will have it looked at in September 2016 when we go to the Gold Coast. We will have to service the engines again soon. This means oil change, new oil filters, fuel filters, impellers and belts. On 22 August 2016 I purchased the additional things I need to do this (apart from oil) and give use at least one new spare of the main things (impeller, belts, filters). I will get engine oil soon, I am keeping an eye out for specials.